Chichester City want to make it a successful season on three fronts. The Oaklands Park outfit are aiming to build on a season which saw them finish in the top six in the Southern Combination premier division and win the RUR Cup. 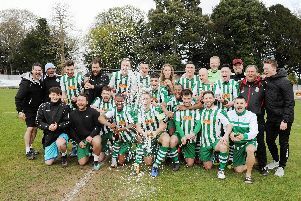 Another strong league season is their No1 aim but they are also targeting runs in the FA Cup and FA Vase to get local football fans buzzing. City have been working hard to improve the squad and have made a number of notable signings. Miles Rutherford and his backroon staff have recruited former Loxwood and Horsham striker Tiago Andrade, former Pagham utility man Terrell Lewis and left-sided former Littlehampton player Ryan Bell. They’ve also secured the services of Italian midfielder Lorenzo Dolcetti for another season despite interest in him elsewhere, while centre-half Connor Cody is back in the area after a spell in Australia and is set to link up with City. Having reached the latter stages of the Vase two years in a row, we should get a bye to a decent stage again, while in the FA Cup, we have gone out far too early in the past couple of years and want to put that right. They have lost striker Scott Murfin, who has returned to Pagham, while captain and centre-half Jack Lee has moved to Michael Birmingham’s Horndean. Goalkeeper Ant Ender is hanging up his gloves after 11 years with the club but is keen to remain involved. Goal ace Jimmy Wild will play for Chi when he can, but is off to the University of Bath. City’s attacking options will again include the likes of Scott Jones and Dave Herbert. Chi first-team coach Danny Potter said the management and players were pleased to be back in training, preparing for what they were determined to make an exciting campaign. “We want to be competitive in the league and do well in the FA Vase and the FA Cup. “Having reached the latter stages of the Vase two years in a row, we should get a bye to a decent stage again, while in the FA Cup, we have gone out far too early in the past couple of years and want to put that right. “Even if you get through a couple of games in the FA Cup and get to the first qualifying round, where this year the likes of Bognor will enter, it can make such a difference. In the league, City were in contention for the SCFL title last season until their form dipped in the final couple of months. Having seen Haywards Heath and Three Bridges promoted to the new-look Bostik League, City are keen to give themselves every chance of moving to the next level. Their ground would need relatively little doing to it if they were to gain promotion. But they know there will be plenty of teams in the SCFL premier eager to do that this season, including just-relegated Shoreham and neighbours Pagham. As reported, City have lined up eight pre-season friendlies. Sat July 7 – Hamble Club A, midday. Sat July 14 – Wick A, 3pm. Tues July 17 – Worthing H, 7.45pm. Sat July 21 – Moneyfields A, 3pm. Tues July 24 – Three Bridges A, 7.45pm. Thur July 26 – Sidlesham A, 7.45pm. Sat July 28 – Christchurch H, 3pm. Tues July 31 – Woking U23s H, 7.45pm.